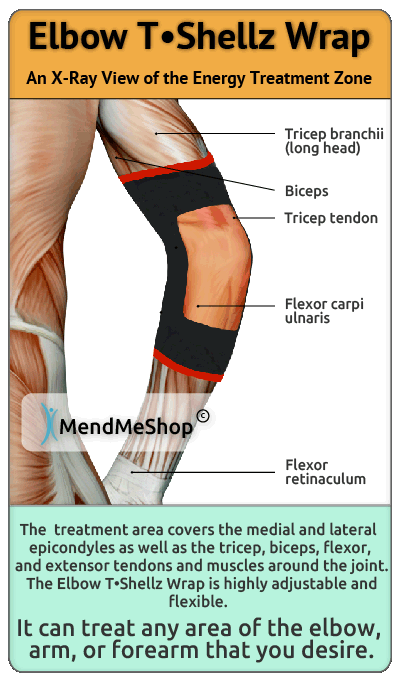 Tennis elbow is a form of tendinosis which means chronic degeneration of the tendon or tendons. You will have tenderness on and around the tendons that attach to the small bony part on the outside of your elbow (lateral epicondyle), and perhaps a bit of swelling but not much. Tennis Elbow tendinosis is commonly caused from the overuse of the tendons located in your forearm that help to extend your wrist and fingers. 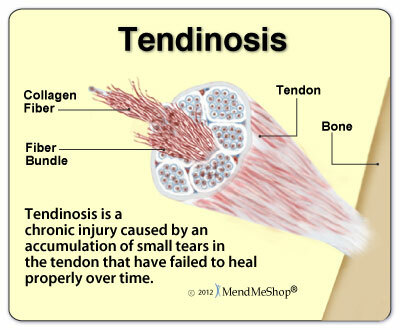 The wear and tear on these tendons is a result of small tears in your tissue that don't heal properly. The inability of your tendon to heal properly causes the tendons to weaken until the tissues become very thin, and eventually wear out. 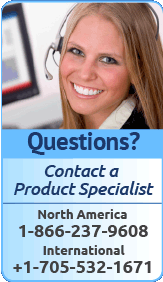 Have You Developed Chronic Tennis Elbow? Tendinosis will get worse over time if not dealt with properly. Your body is trying very hard to heal the damaged tissue. 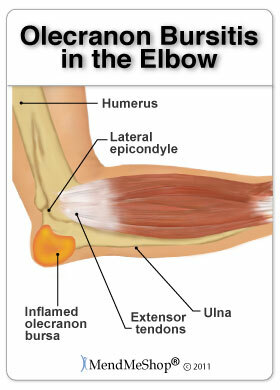 This cycle of pain, swelling and unhealing causes tennis elbow to go on for a very long period of time (ie. years). Why? Failed healing, not inflammation; if you cannot rest the elbow while you are healing then your odds of healing it for good are quite low. Tendonosis is a noninflammatory, degenerative condition of the collagen fibers in the tendon often caused by repetitive stress injury of the tendon fibers. As the collagen breaks down, the typically straight and flexible fibers become a tangled mess with little pockets of jelly. 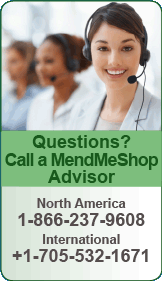 Tendonosis is caused by repetitive motion which causes an accumulation of microinjuries. The tendon tries to repair itself but eventually the breakdown of the collagen fibers exceeds the repair speed and the new collagen is produced with an abnormal structure and composition. Unlike tendonitis, there are no inflammatory cells with a tendonosis injury making it hard to diagnose visually as there are no visible symptoms such as swelling, heat and redness. However, both injuries cause pain, tenderness and stiffness of the joints. If not treated correctly the tendon will continue to degenerate causing further injury. Do You Really have Tennis Elbow? Visiting your doctor when you have elbow pain is always recommended, as there are many possible issues that can happen within the arm and elbow. Sometimes, one set of symptoms can result in multiple diagnoses. Tennis elbow is sometimes misdiagnosed as bursitis or arthritis. Crystal Deposits. Some people with diseases such as rheumatoid arthritis, gout or scleroderma may contract bursitis from crystalline deposits in the joints. Although not much is known about how this process happens, it is common knowledge that Uric acid is a normal byproduct of daily metabolism. If you are diagnosed with gout then you are unable to break down this uric acid properly, leading to crystallization of this excess acid which deposits in joints, a painful symptom that can often lead to bursitis. Golfer's Elbow Tendonitis. (medial epicondylitis). Golfer's Elbow is signified by pain, swelling and inflammation that is felt on the inside of the elbow. The tendons attached to the bone at your elbow are connected to muscles in your forearm, which is why these injuries will sometimes cause pain in your forearm. These injuries are usually caused by racquet sports, golf and overuse from gardening and repetitive movements of your hand or wrist (ie. using a screwdriver). Speed Up Healing of Your Tennis elbow! The good news is that most cases of tennis elbow will heal with simple home conservative treatments and surgery is often not needed! It's generally understood by doctors and surgeons, that surgery will introduce more scar tissue into the elbow. 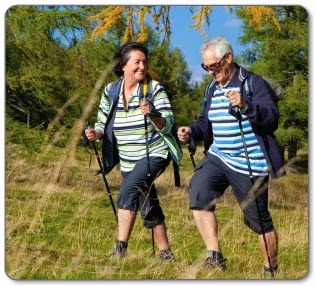 This added scar tissue will be problematic, requiring physical therapy and conservative treatment options post-surgery. This is why surgery is only performed as a last resort for chronic elbow injuries or a fractured bone that won't heal with conservative treatment methods. 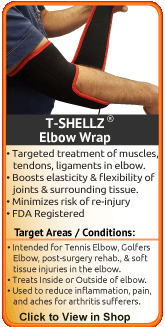 A Deep Tissue Therapeutic Elbow TShellz Wrap to increase Blood-flow to the injured elbow (Deep Tissue Therapy Therapy). 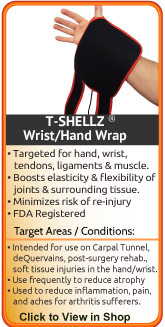 We believe the use of T•Shellz Wraps for effective treatment of soft tissue elbow injuries is one of the most under-utilized home treatment options available on the market today. 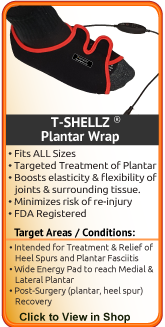 We have thousands of customers that have tried many options out there and have been amazed at how effective and fast the TShellz Wrap treatment can heal soft tissue injuries. 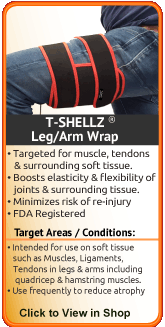 Deep Heat from the wrap will trigger increased blood flow in your elbow. 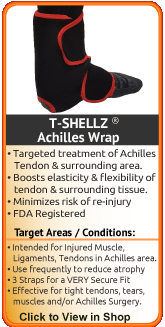 Increased blood flow will accelerated the healing rate of soft tissue. 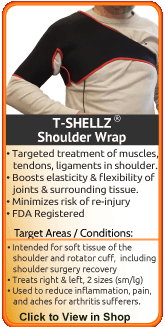 If you want to avoid re-injury, manage pain and increase circulation for lifelong health benefits, a Cold Compress or Ice Pack and an Elbow T•Shellz Wrap® will provide the results you are looking for. 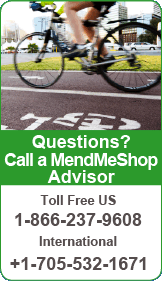 Why spend time in pain, off from work, and missing out on your active lifestyle when you can be proactive about your injury and the health of your body? 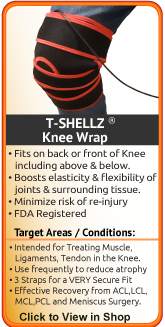 Talk to your doctor about incorporating a regular routine of using an Elbow T•Shellz Wrap®.